It is an honor to be part of "75 Collective" in December 2018. In addition to offering our regular Sashiko Stitching Workshop (Core & Basic) at 75 Collective, the organizer of the event and I came up an idea of sharing the very preview of what Sashiko is like by offering short-term workshop, about one-hour length. 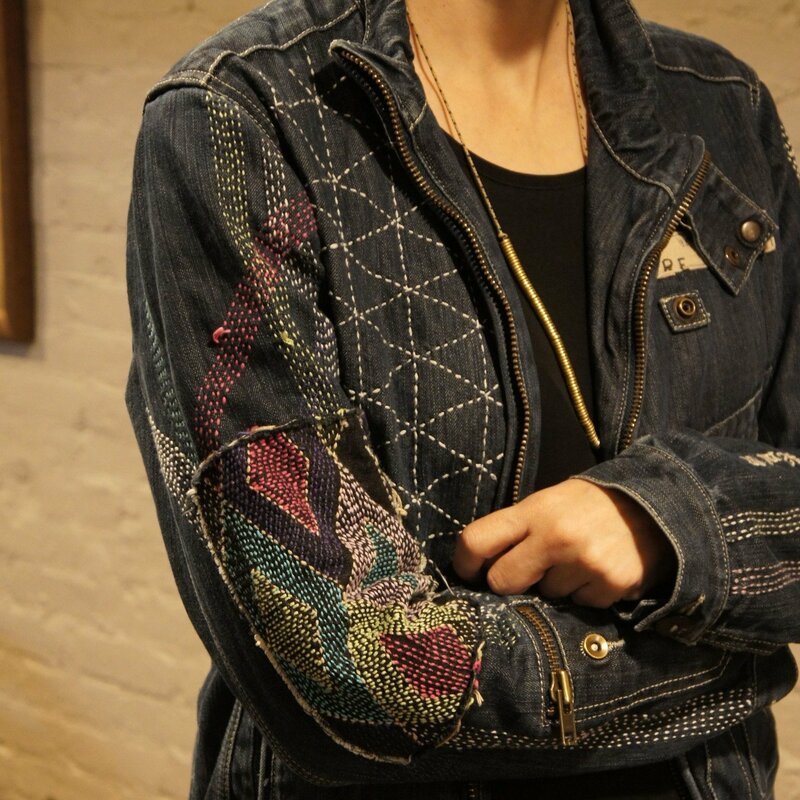 Here is what I come up with to introduce Sashiko & its application to Denim you have. Please bring your own denim with a hole or tear. Please contact me if you prefer bring the Denim without any hole or torn. The denim with more damage would be fun to work with. Sashiko Artist, Atsushi, will introduce the quick preview of what Sashiko is for the first few minutes. After that, we will prepare the Denim Patch together, then start Sashiko stitching on the Denim you bring. The workshop will be held on a stage in the event venue. The workshop will be somewhat loud and energetic. Only the participants who registered this workshop can receive the package of materials, instructions, and answers to the questions. However, anyone who visit the event can view what we do and I will answer the general questions from the visitors. I will NOT teach how to use the Sashiko thimble and the Sashiko needle. I will share how to use them, but will not check if you follow the posture or not. Because of (1) and (2), if you are interested in Sashiko Stitching and more personal attention with learning how to use the thimble and needle, please consider signing up to the Sashiko Stitching Workshop (Core & Basic). Same weekend & the same building (but in a private space in the different room). *The minimum numbers of participants: 3 participants | I will do my best to advertise the workshop.